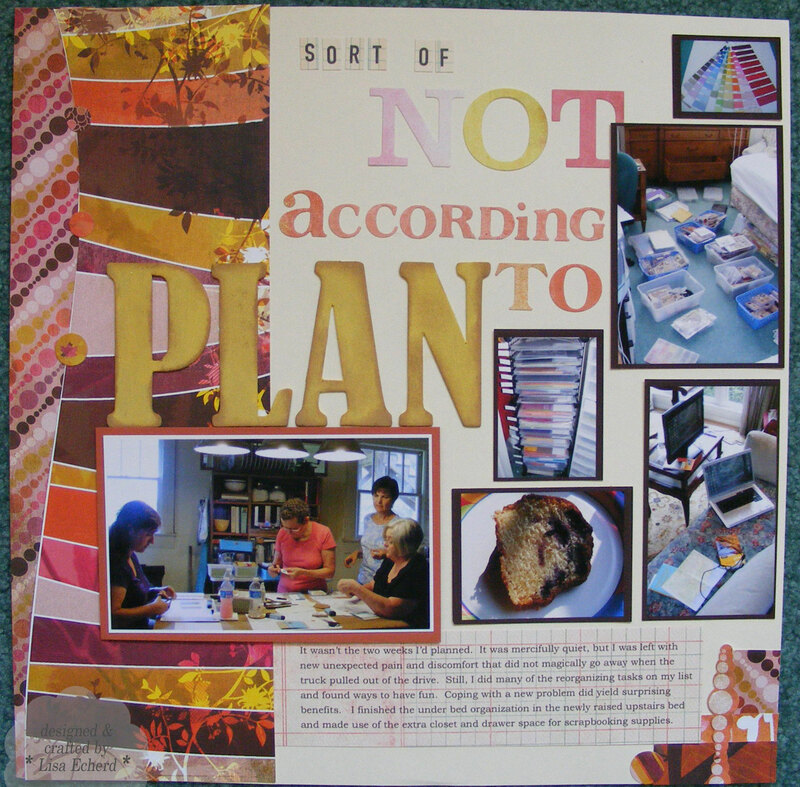 Not all scrapbooking is about the most joyous occasions. I think it important to record what really happens even if it isn't all like you expected it to be. 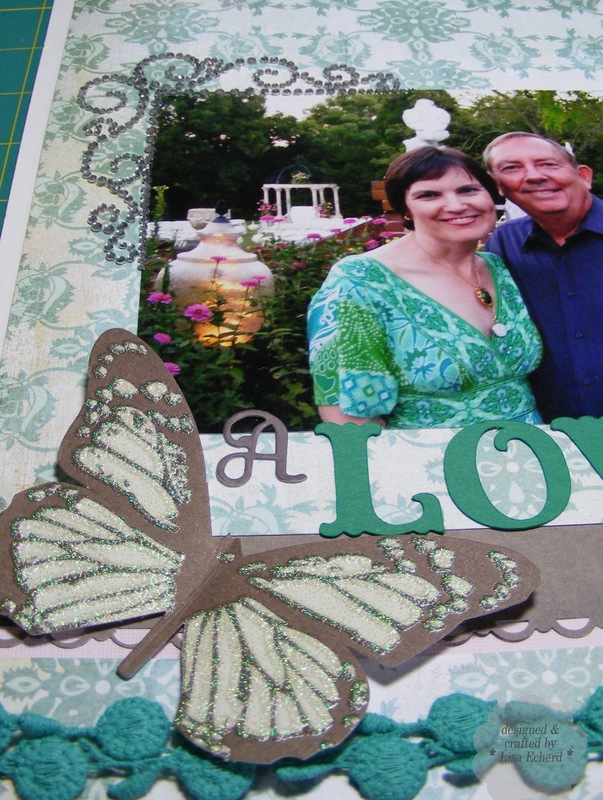 One of the "Joys of Scrapbooking" is that it can be therapeutic and eye opening to write about an experience. 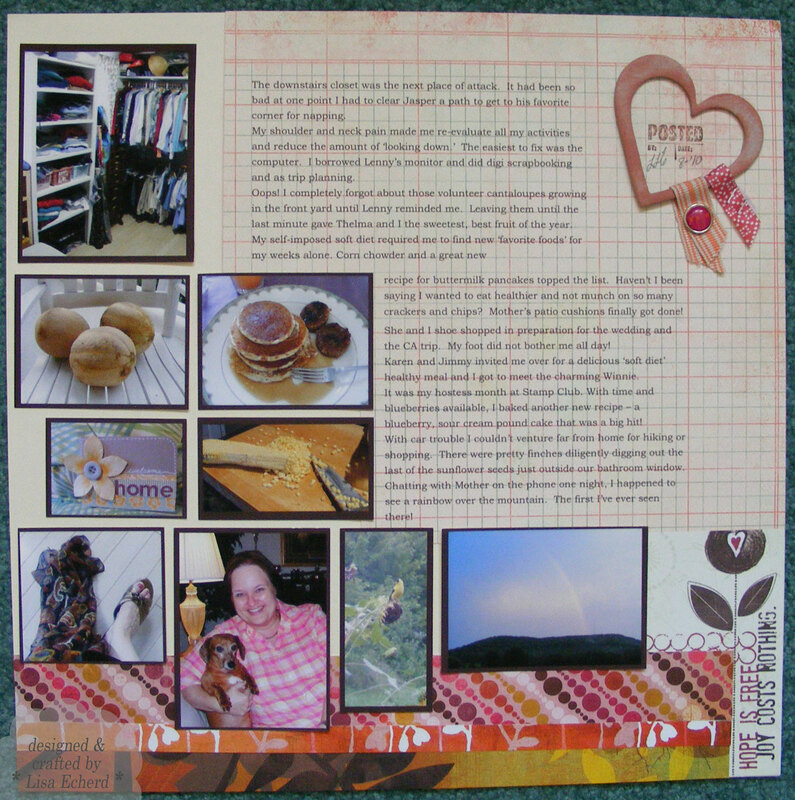 That is what happened when I did the pages for the quilt I made as a gift this summer. 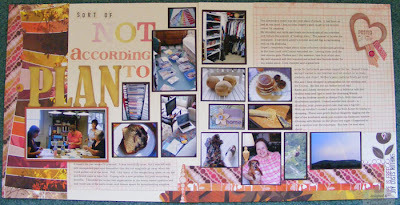 I could have just done a one page layout with some photos of the quilt and how I rushed to complete it, but that isn't really the story, or the lesson. When we went to Amanda’s wedding, I finally remembered to take the quilt along I’d planned to give to Dillon. 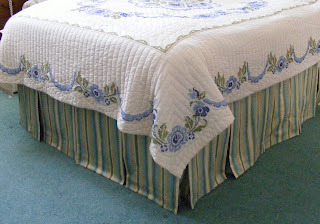 My grandmother had two quilts made for me when I was in my teens. One was a large LeMoyne star in red, white and blue! What was she thinking? I always thought it would make a good ‘boys’ quilt. Since I didn’t have any children and Lenny had daughters, the quilt has been in storage all this time. Dillon loves red and these are the colors in his room so I just figured I’d give it to him. I didn’t figure he would care that much about it. I didn’t even give it to him personally, just handing it off to Stanley to pass along. Well, I seriously underestimated his enthusiasm. He loved it. That night at the hotel, he and Nai Nai built a fort with his quilt and he slept under it each night. About a month before we left for Hilton Head, it began to nag me that I didn’t have a quilt for Nai Nai so I decided to make one. I knew it would be a rush and I already had quite a bit of window treatment work to do. Still I had been dying to work with Kaffe Fassett fabrics and I found a place to order them on-line. I spent what seemed like hours downloading photos, working out a layout and making the final selections. When the order came in, I went right to work prewashing and finalizing my layout. With only a few weeks, the quilt had to be a simple design. I’d chosen Nai Nai’s favorite colors of hot pink, purple and a little orange. It was to be bright and cheerful, just like her. I cut and sewed steadily around my other work. I even machine quilted using the free form quilting foot. Definitely, not a work of art, the quilting did give me experience. And of course, I’d cut myself terribly short on fabric but soon, sooner than I’d expected, the 60” x 80” quilt was complete. I couldn’t wait to give it to her. I did wait though, until about the 3rd day of our trip. This shouldn’t be rushed along with all the other new things they were seeing and doing. I’d been giving them a toy a day to play with in the condo. One morning, I told her I had a surprise for her and we would wait until everyone was together to give it to her. She made sure the family was assembled as soon as possible. I went back to the master bedroom closet and brought out the bag. This is where I’m supposed to say how excited she was – just like Dillon had been. She was polite. She didn’t say much. 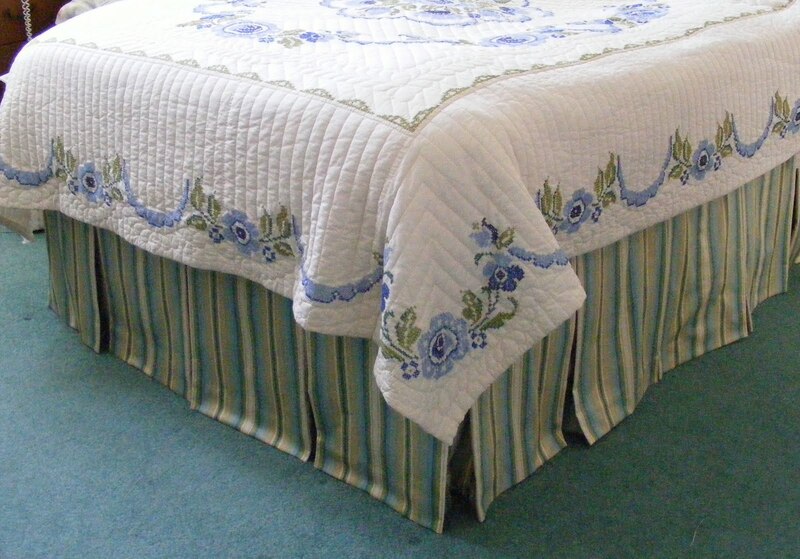 She looked at the quilt, Jaime showed her some of the details and I could tell it had fallen flat. I folded it back up and it wasn’t touched again until Stanley packed it back up to take to their house. Lenny said that she would appreciate it when she was older. Now that I think about it, her reaction was much like mine was to the red, white and blue star quilt. (I’d have loved it if my grandmother had made me a quilt herself.) Anyway, Nai Nai’s is a pretty quilt and large enough for her bed in Branson. Maybe some day it will mean something to her or maybe she will share it with someone who will love it. For now, it means something to me that I was able to make her a gift. 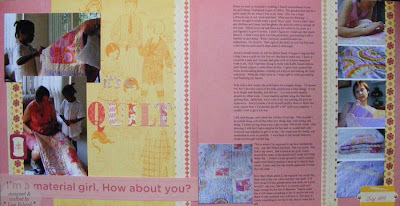 It wasn't until I was writing this journaling that I realized the similarity between Nai Nai's reaction to my quilt and my reaction to the one my grandmother had paid to have made for me. Both were given out of love and both were received with only polite thanks though for different reasons. It isn't surprising that Nai Nai was expecting a toy rather than something she hardly needed in the middle of summer. This also reminded me of my lukewarm reaction to my Aunt Clara's Christmas gifts when I was a child. Each year a package would arrive in the mail from the west coast. Mother would not let me open it until Christmas and I knew it would be clothes. But each year I secretly hoped it would be a doll or some kind of toy. Those clothes were much appreciated by my Mother and fortunately my aunt never knew that I was just a bit disappointed. Now I know that my reaction wasn't all that important anyway. The clothes were as much for Mother as they were for me providing something extra in those early years when there wasn't a lot of extra money. And my aunt must have loved shopping for them. You see, she lost her own daughter to disease and missed having a little girl to shop for. I only regret that I never thanked her properly for her gifts. I have noticed over the years that some things I make really go over big and others, often the ones that took the most effort, are met with just a 'thanks.' It doesn't matter that much as long as you give out of love. Hope you have a great Wednesday. If you want to relax in front of the TV tonight, check out the Defenders at 10 Eastern on CBS. I watched last week because I usually enjoy Jim Belushi. The show was much better than I expected - the characters have more depth. Definitely worth seeing again. 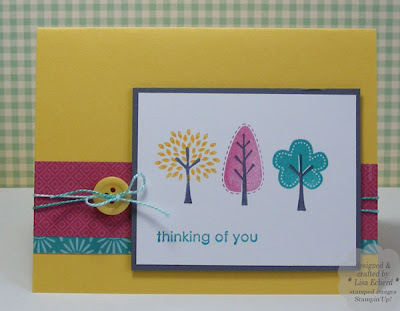 Ingredients: Stamps: Trendy Trees by Stampin' UP! DSP: Thoroughly Modern by SU! Tying bows is the main thing that causes most of us crafting frustration. Here is a link to a great bow and knot tying video on Dawn McVey's blog. I found this via Kristina Werner's blog and wanted to pass it along. Also I've included a few things that work for me when tying knots and bows. Often I find I like my knots better when I turn the card upside down to tie them. It seems the tails come out in the right place that way. I'm right handed. Softer ribbons yield prettier bows. Satins are easier than grosgrains no matter who makes them. However, as great as Stampin' UP! 's products are, their grosgrain ribbon is very stiff and hard to tie. Papertrey Ink's or fabric store ribbon are easier. Slip some glue dots inside the knot after tying to keep a bow from coming untied. Fiddling = Frustration. After you are happy with a bow, stop messing with it! Obviously, I'm not a world class bow tier even with instruction, but believe me these are an improvement particularly using grosgrain ribbon. 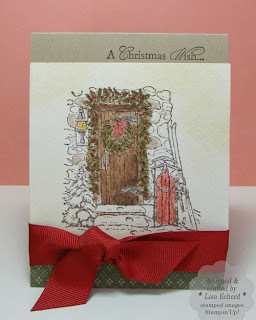 Ingredients: Stamps: Home for Christmas by SU! A few weeks ago we went to the most perfect wedding. My cousin Alisha married Kris on the grounds of a historic home. It was just beautiful. In all the photos I made there wasn't a good close image of the bride and groom. So I did a collage and included as many photos of my family as I could. 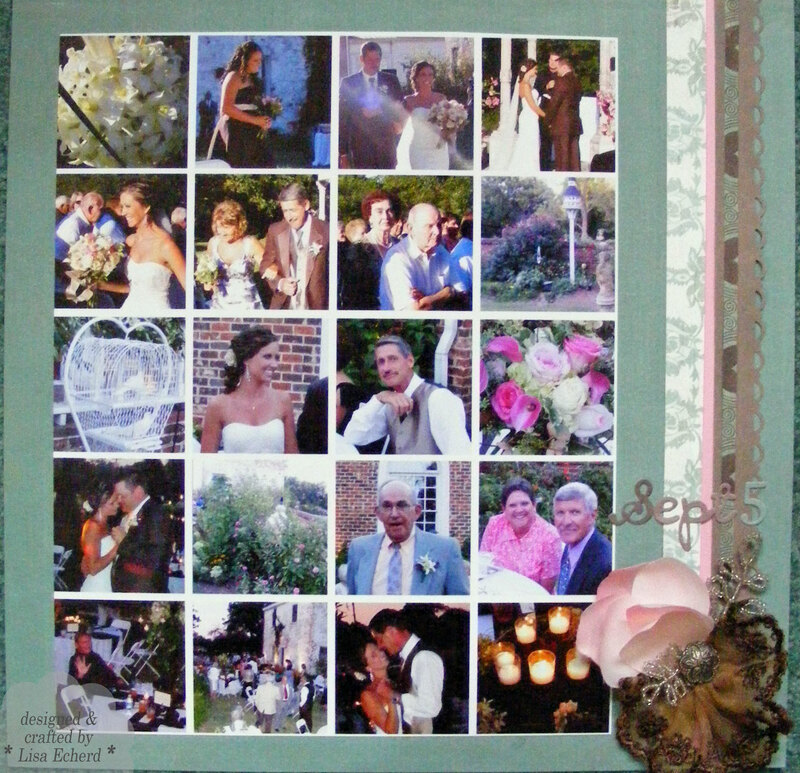 Alisha and her father, my cousin Johnny, are in the two center photos of this collage. 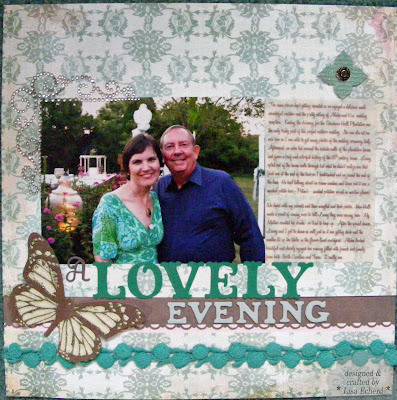 "LOVELY" was cut with the Cricut Storybook cartridge. I bought this cartridge for all the images and thought the font would be too frilly to use but I love it! 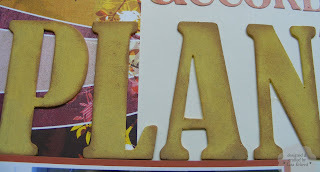 I didn't have quite enough of the aqua and ivory background paper for the first page so I spliced in the brown paper which provided a contrasting background for the flocked chipboard letters. I didn't have the pink rose I really wanted for the right hand page so I pulled apart another pink silk flower, darkened the petals with Regal Rose craft ink and glued them together with glue dots. 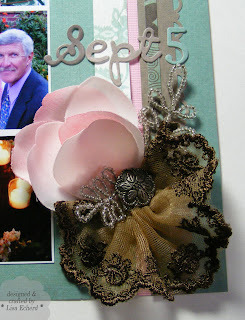 The remainder of the flower is made with some wonderful Webster's Pages lace in just the right shade of brown to complement the wedding colors. The butterfly is from a Crate Paper collection. There was a butterfly fluttering over all the floral arangements during the actual ceremony. They couldn't have planned a more appropriate touch for their ceremony. 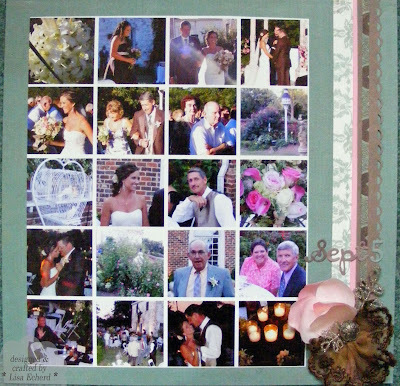 The journaling is printed on vellum and details some of the pretty touches of the wedding. With perfect weather, beautiful grounds, interesting floral arrangments, good conversation, a happy bride and great food, no wonder eveyone kept saying it was a Lovely Evening. Before Creative Memories went to a true 12x12 inch scrapbook size, I always had little strips of designer paper left over from cutting 1/2" off one side of the background paper. Now I get them from all kinds of projects especially when I use 6" or 8" square paper pads. Those sizes just don't fit quite right for standard cards and there are leftovers. I was truly down to the little strips on a few of these papers and I'm glad they found a home on this kitty card. 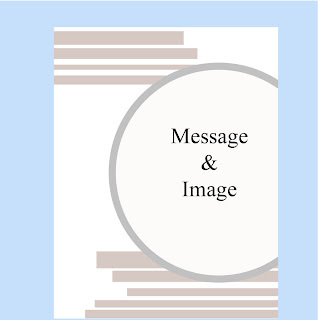 Adding circular cardstock for the stamped image balances all those lines. 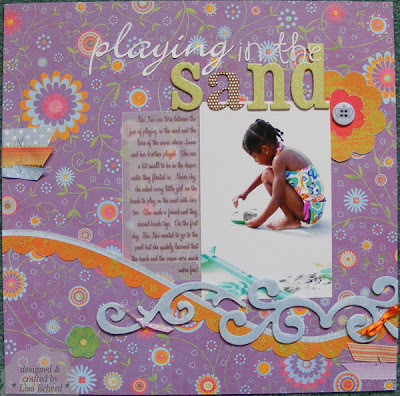 Cardstock: Whisper White, Naturals White and Baja Breeze by SU! Brads: Oriental Trading and Stampin' Up! Christmas. Or Christmas Eve rather, that magic day when every bow must be tied, every cookie baked and every little head tucked into bed. I love Christmas! While I can understand why some people opt out of the holiday fuss, I revel in it. There are a few things that frustrate me - mainly finding gifts for my parents who are impossible to shop for. We've tried lists which my Mother and I love but my Dad refuses to participate and he's the biggest challenge! So for now, I'm not going to think about that. 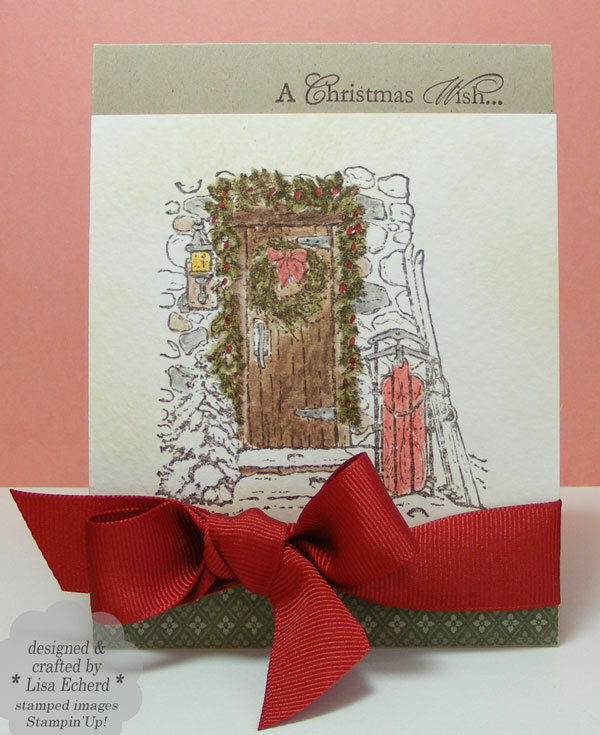 I'm going to think about making cards, decorating the house, and making handmade gifts. For this card, I broke out the Christmas punch set I got last spring as a Hostess Gift. I hadn't even mounted it yet. Join me tomorrow for DSP Day and a cute card using lots of little paper strips. At least it is cute in my head, better get it down on paper soon! 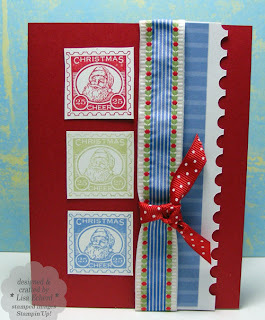 Ingredients: Stamps: Christmas Punch by SU! DSP: Brocade Blue by SU! The journaling for this title page of our Hilton Head trip this year is enclosed in a vellum envelope I cut with the Plantin Schoolbook cartridge on the Cricut. I wanted to include our expectations and experiences in sharing our favorite island with those we love. 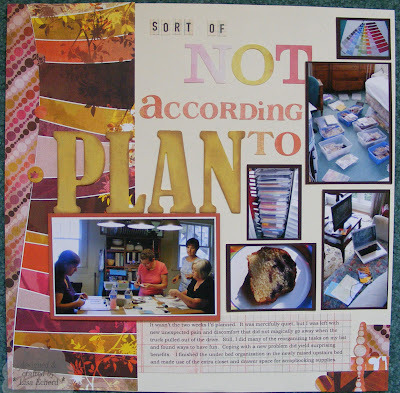 The joys and challenges - and there were mostly joys - aren't something I'm going to read every time I go through the scrapbook and aren't necessarily things I want to share. 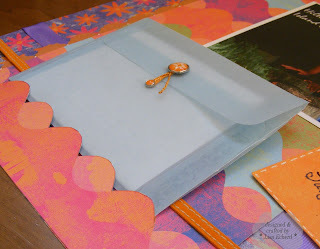 Including journaling in an envelope can include your thoughts without making them readily accessible to every pair of eyes that sees your scrapbook. I cut the scallop design out of the designer paper with a craft knife so it kind of looks like the envelope is sitting in a sand dune. I think we all look pretty good in this photo for it to be 6:00 a.m.! I always forget to do the group picture until the end of a visit and they were truly loaded and ready to hit the road when we gathered before daylight in the condo parking lot for this shot. I don't know about Jaime, but I didn't even have on any makeup! Oh well, it's the beach after all. 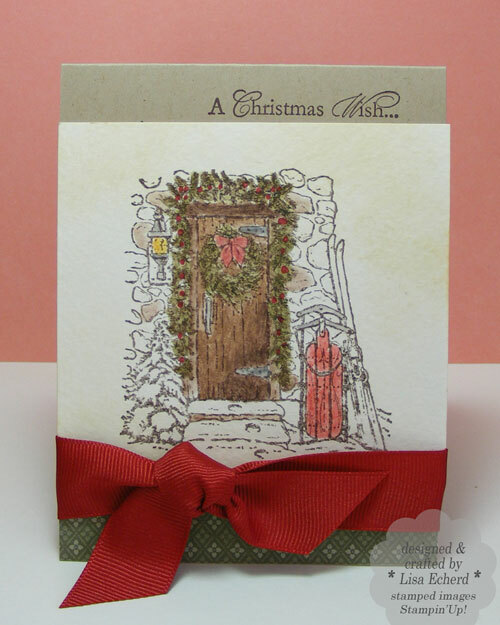 To create the white distressing on this page's chipboard, I brushed on a little white craft ink using a course paintbrush. White craft ink takes a particularly long time to dry so be sure to allow plenty of time. It only took one or two drops of white craft ink. A little goes a long way. 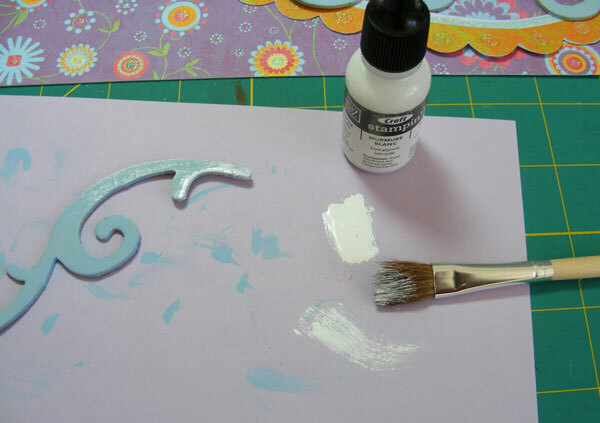 Before distressing, I painted the chipboard with blue acrylic paint. 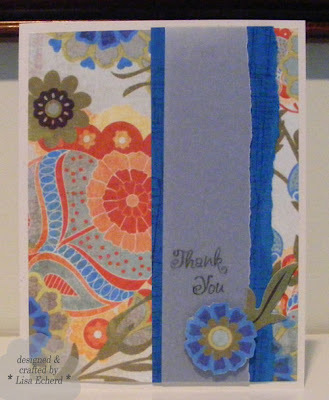 The scallop border is cut from another piece of designer paper in this collection. It was already curved and I just tilted it the way I wanted it to go. 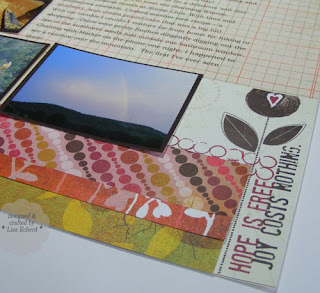 If you are using vellum for your journaling and it doesn't show up enough on a busy background, just tuck another piece of vellum underneath. Two layers of vellum will still give you the light slightly see through look and you can read the journaling better. The photo in this layout was very over-exposed so you can't even see the ocean in the background. It was unintentional yet I really like how it looked. The focus is on Nai Nai and that is all that is important. 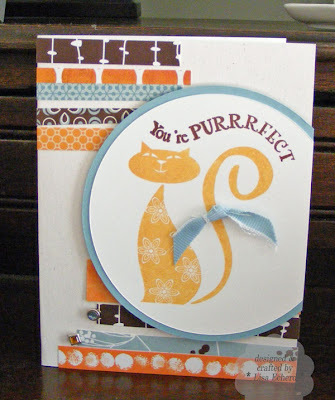 I loved last week's Splitcoaststampers sketch and finally had time to use it in a card. This is the same paper collection as my last card. I wanted something that would be easy to match in markers for coloring in the bird and flowers. Thanks for stopping by! TIPsy Tuesday will be back tomorrow with different use for Craft ink. Ingredients: Stamps: Birds Galore by Inkadinkado; Cheep Talk by SU! 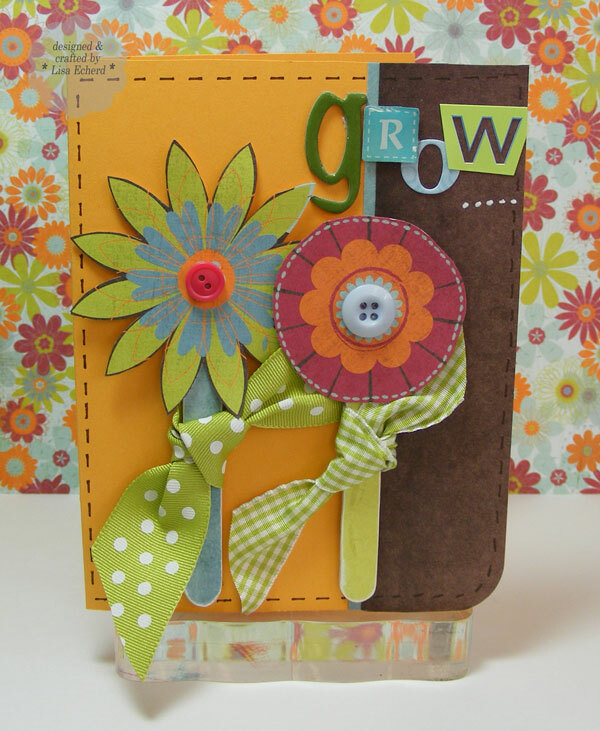 This week's card takes advantage of some floral paper. I've cut out two flower designs from a Fancy Pants paper and mounted them on popsicle stick stems with ribbon leaves. This was a really fun card to make! The card layout is very simple, just a folded piece of cardstock with a 1 1/2" border of designer paper on one side. When cutting out the flowers, you may not want to use the whole flower as shown with the round one here. Also the one with petals had some overlapping color from another flower. 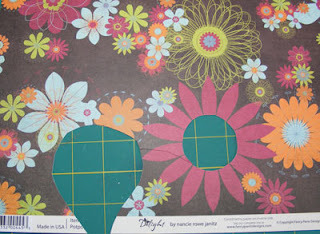 I just positioned it on the card so the other color was covered with the circle flower. 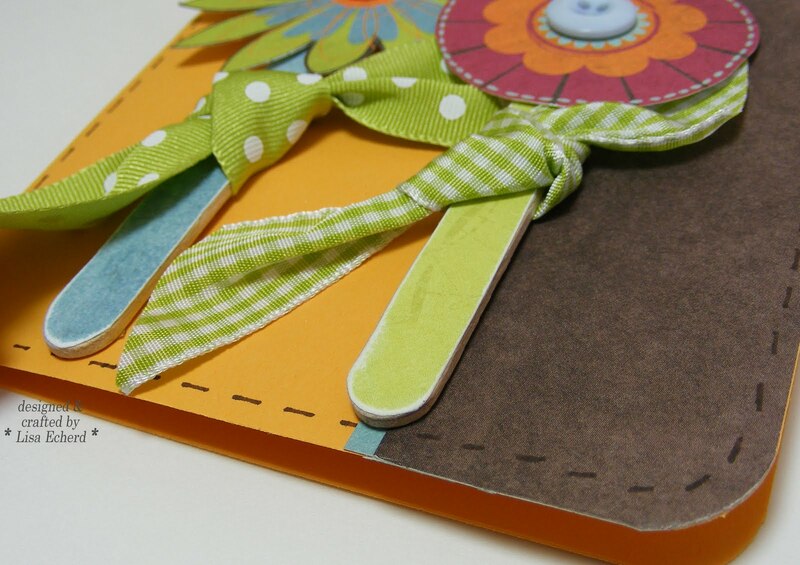 To make the stems, cover popsicle sticks with designer paper, trim and sand the edges. I can't let the day end without commenting on the end of my favorite television show of all time. As the World Turns ended its 56 year run today with a lovely episode that wrapped up all the characters lives in a neat package. I think the show has done a superb job of finalizing all the characters stories, tying up loose ends and paying tribute to their past. Why did I love ATWT so much? I've watched this show all my life when given the opportunity. My grandmother and I used to discuss the show. Since high school, I've seen it live or recorded it every day to watch after work. It was my stress relief. No matter what happened to me, I could lose myself for about 40 minutes (fast forwarding through commercials) in the fictional lives of characters I've known forever. I love a series. I want to get to know my characters - love them or hate them. The best characters are those with complex layers you love to hate or love despite all their flaws. Over a year ago, I started watching General Hospital figuring ATWT would get cancelled. I'm enjoying GH a great deal but I don't feel the same connection to the characters. While their production budget would make a huge dent in paying off the nationa debt and provides spectacular results, General Hospital's 80's style is too rich to identify with. Don't get me wrong, I'm glad I started watching it and I'll enjoy it as long as possible. It just won't be the same without ATWT for entertainment. Hi! Home from California where we had a wonderful time visiting friends in Santa Rosa. We also drove up to the Redwoods National Park. 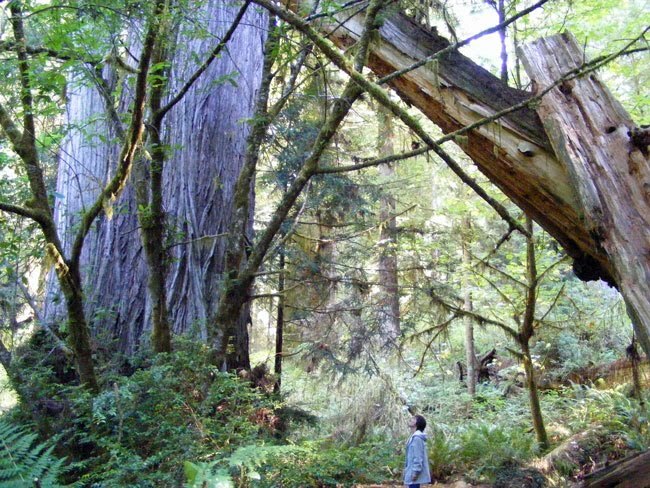 I'm the tiny figure in the photo above below these enormous redwood trees. We saw beautiful coastline, gorgeous flowers at the Mendocino Coast Botanical Garden and spent precious time with friends. It is warm and sunny and blessedly humidity-free in Santa Rosa. The scenery and the food are fabulous. More about our adventures in scrapbook pages to come. For now, I'm knee deep in laundry, the frig is empty, the mail awaits at the post office and I just turned up the A/C. Why did I come home again? Oh, yeah, so I can scrapbook all these great times and see my wonderful family. That is next up. BTW As The World Turns airs its last episode today. I'm trying to catch up with daily recaps at CBS.com so I can watch my faithful entertainment one last time. 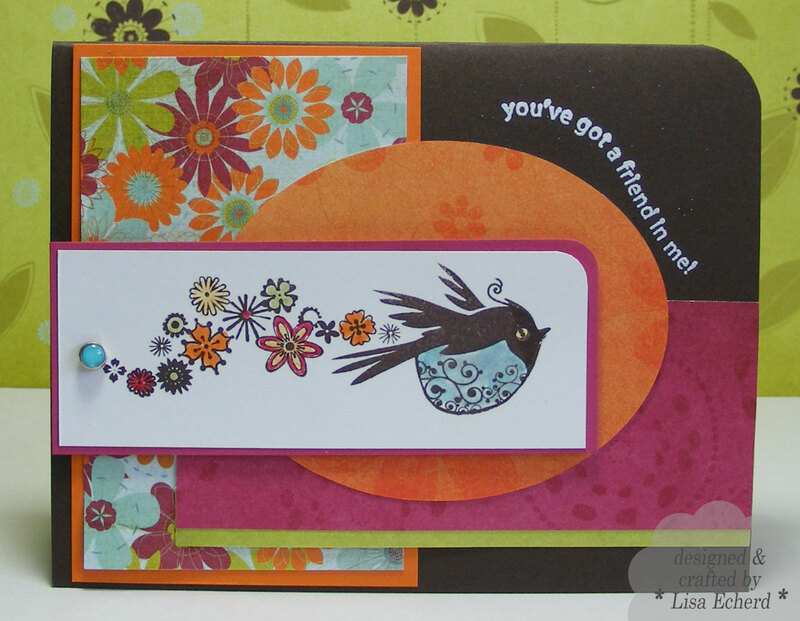 Here's a fun and very fast card using Stampin' Up! 's Sweet Pea paper pack from last spring. You could substitute any fun pattern paper for the Tucan and then use two narrow strips on the bottom to compliment the main paper. I didn't want a mat for the Tucan paper but it was not quite heavy enough to be adhered with dimensionals on its own. I backed it with white cardstock cut slightly smaller so it doesn't show but adds weight. 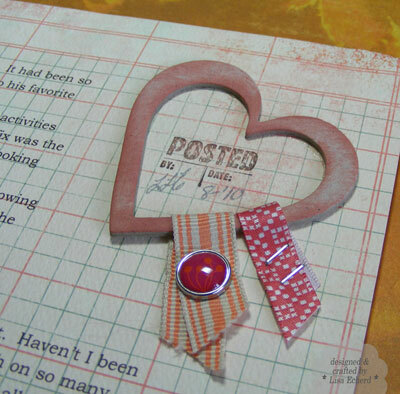 The ribbon is just folded over and the buton glued on for a slightly different look. Corner rounding on several pieces adds a lot of interest with very little time and no additional materials. I'm sorry I didn't get a sketch made of this one but it is pretty straight forward. Thanks for stopping by! 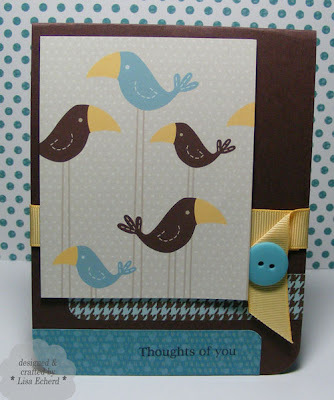 Cardstock and ink: Chocolate Chip by SU! Ribbon: So Saffron by SU! There are lots of strategies for preserving children's artwork, stories they have written, and other momentos from their school days. I've seen scrapbook pages where the artwork was scanned and then shown in a small size on a scrapbook page. For Dillon's book, I make pocket pages. 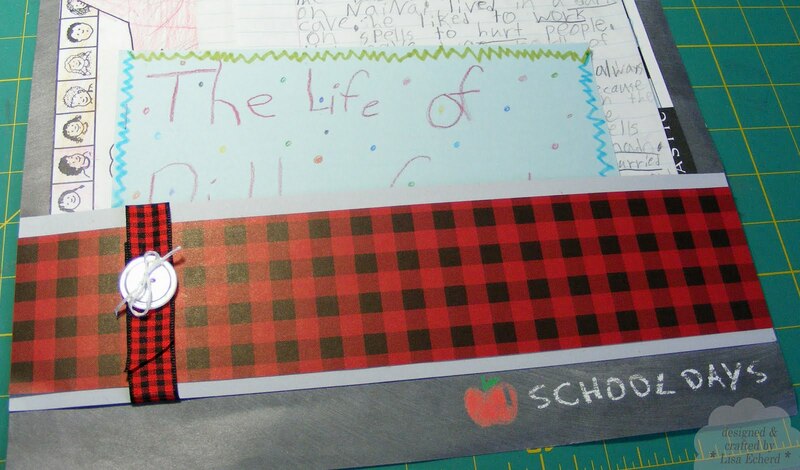 This year, I did one page for his school work - mostly stories he wrote. 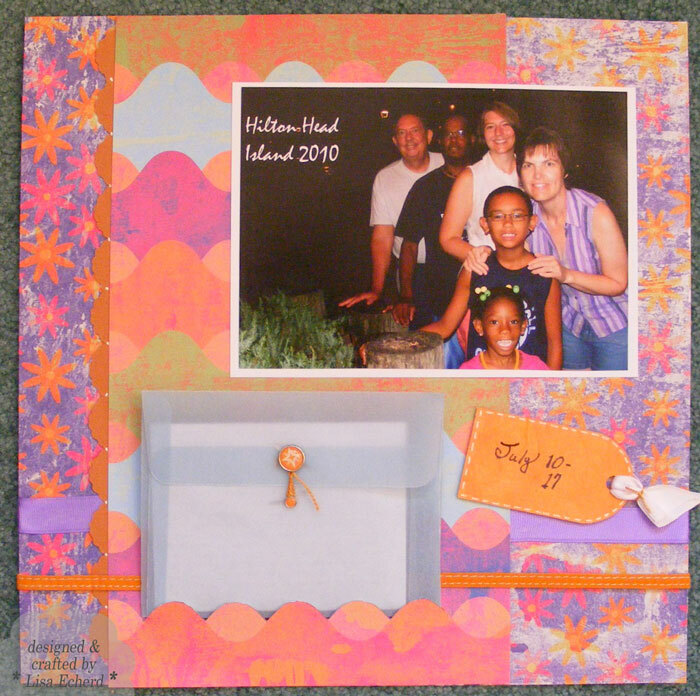 To hold my pockets in place, I use Creative Memories Photo tape. It really sticks so my pockets don't come loose. The other two page spread shown above includes pockets to hold reward certificates, grade sheets and other items Jaime has accumulated. To see what is inside the pocket, make it with Vellum or transparancy film. 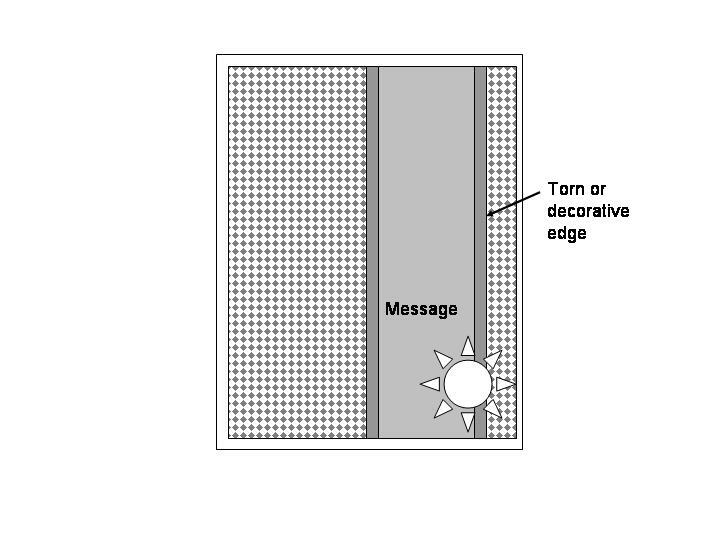 First secure your transparancy or vellum in place with removable adhesive in the center. You can then also sew around your pockets. Remove the removable adhesive and embellish as desired. 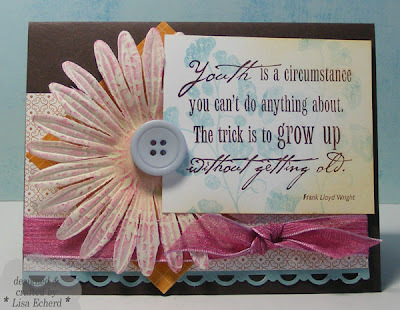 Just a few ideas on corraling all the cute things you receive from a child or grandchild. Thanks for stopping by! Cardstock: Crushed Curry, Pumpkin Pie by Stampin' Up! 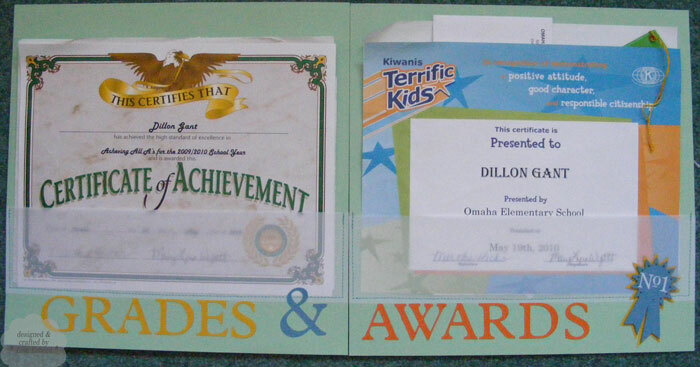 Each summer Jaime brings me photos, school work and keepsakes from Dillon's last school year. Since we were at the beach together this year, I didn't get to do the pages while we were together. 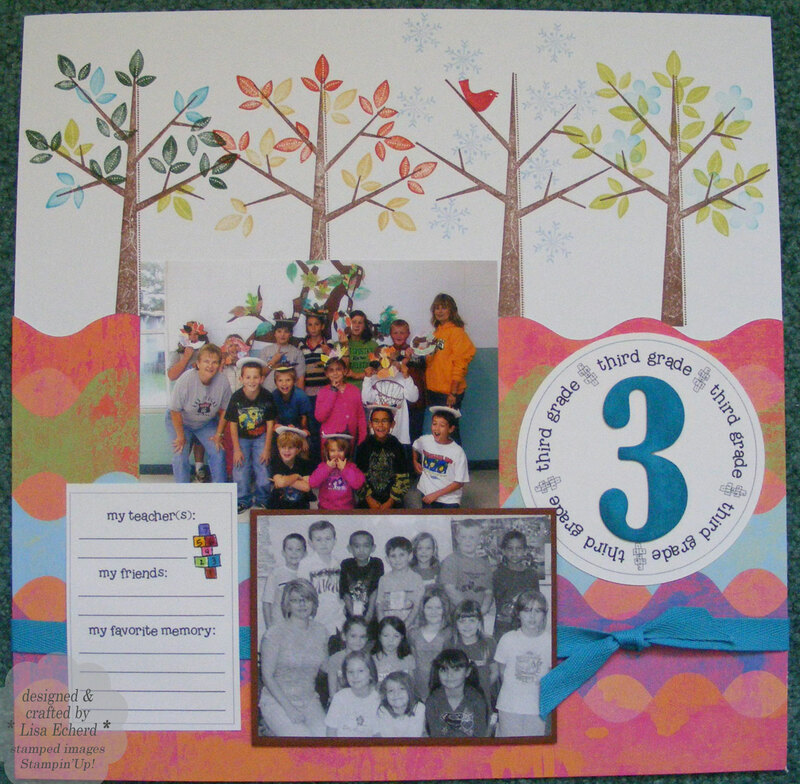 Finally, this weekend I've pulled them out and put together several pages of 3rd grade. Here is the first page. 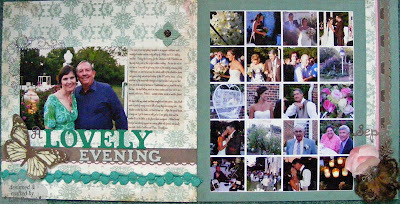 Taking a queue from the backdrop on the top photo, I used Stampin' Up! 's Season of Friendship set to do a 4 seasons mural for the top of the page. The "3" backdrop and the journaling block are from a downloaded class I took when Scrapbooks Etc. magazine used to do a on-line conference. 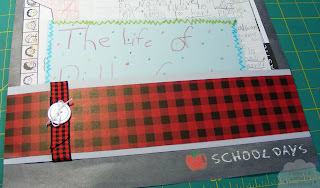 In some of the other pages, I'll give her more journaling blocks to caputre the memories from the last year. Ingredients: Stamps Season of Friendship by Stampin' Up! When Lenny visits his family, I always have this list of stuff I'm going to get done. Some of it chores, some fun things just for me. I even did a "Me Time" scrapbook page about the things I did the last time he went to see his children and his sister earlier this year. This summer though things didn't quite go as planned. I developed some intense stress related pain in my neck and shoulders. Basically, it hurt to tilt my head down for several weeks among other things. Of course, I spent a lot of time trying to figure out what was wrong and how to deal with it. Thankfully, it is getting better. And I've learned a lot about posture, about the right way to sit, work, craft, read, even stand while I'm doing dishes. I'm trying meditation again. Did you know there are all these 'guided meditation' videos on YouTube? It's sort of like being in Yoga class without having to travel or bend yourself in funny positions. You get to skip to the relaxing part and it really does help. During the two weeks he was away, I did do a few things on my list though more slowly than I planned and mananged to have some fun with friends. I made myself special treats in the kitchen though different ones than I planned. With my car in the shop part of the time - yeah, it was sick too - I couldn't go anywhere much and I noticed more pretty images out my own windows. All of the photos were printed with a brown background so I could trim them and they were self matted except for the large image of our stamp club. PLAN is chipboard painted yellow which came out too lemony so I went over with with sponged Crushed Curry ink - note: be very careful to make sure the paint is fully dry or don't double dip your sponge. You'll get paint on your ink pad - yuck! Last step was to brush the edges with some Vintage Photo from Ranger. The heart is inked in Stucco pigment ink from Colorbox. While the ingredient list below is long, the heavy lifter was Basic Grey's Indian Summer collection. I bought this just because it was pretty but I've lost track now of the number of layouts and cards I've used it one. Apparently I like orange, yellow and magenta more than I thought. Those little stickers that come with the kits often come in great for 'touch-up' embellishments to cover slight flaws in your design. 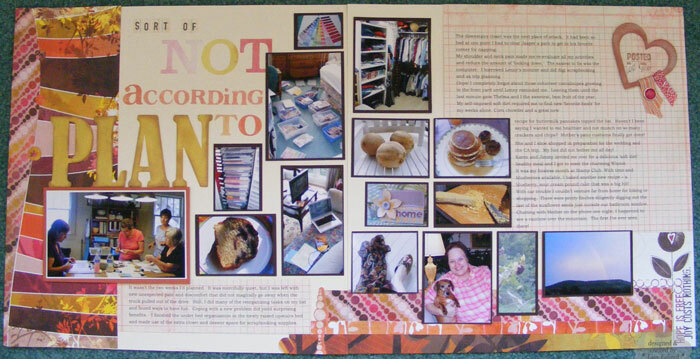 The design in the lower right corner is a journaling card from Fancy pants that seemed to capture some of the experience. Ingredients: Stamps: Office Accoutrement by Stampin' Up! Ink: Dark Brown, Stucco by Colorbox; Vintage Photo by Ranger, Crushed Curry by SU! 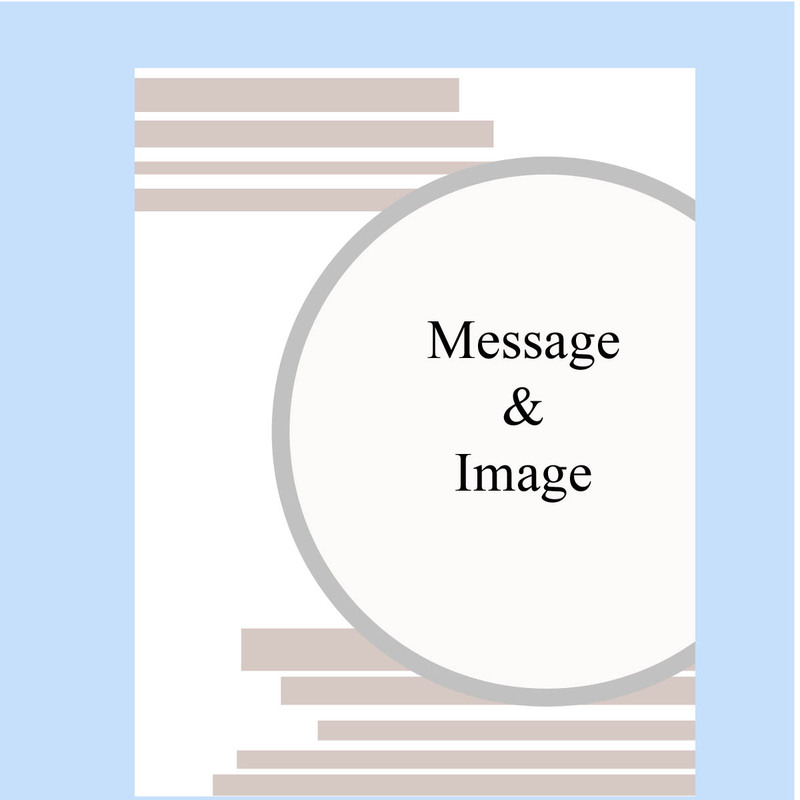 A general design rule for large, high contrast prints - keep it simple! 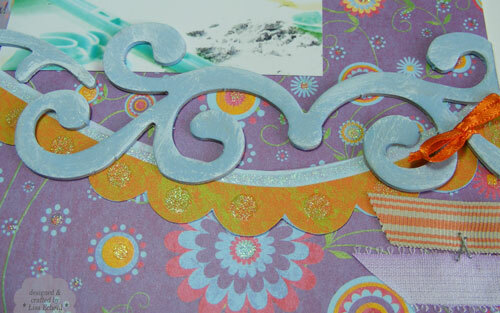 So here is this week's Designer Series Paper card using a very bold print from Basic Grey. The solid strip is stamped with a backgound stamp to give dimension. 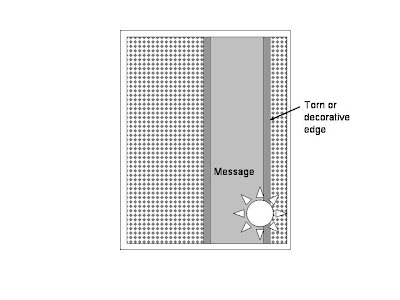 The edge is torn but you could also do a scallop or other decorative order. Cut the vellum longer than the card and wrap the ends around the back and attach on the backside. Then you don't have to fuss with keeping adhesive from showing on the front. The flower is cut from the same DSP. The leaf is a sticker from the paper collection. Very simple, very fast card. Have a great weekend. 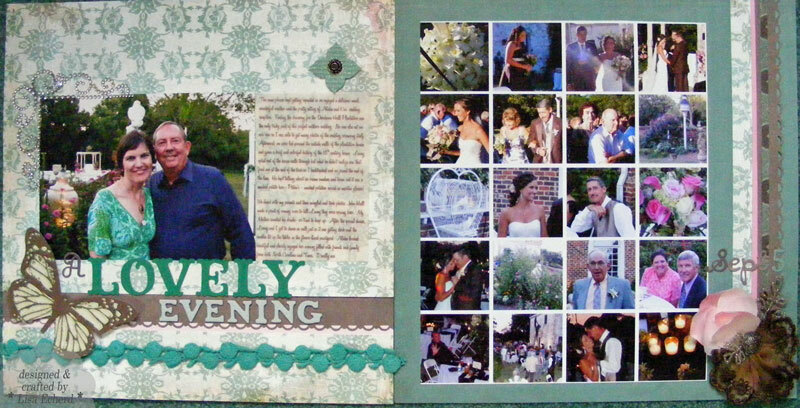 We are planning to go to a family wedding and I hope to get in some more scrapbooking. 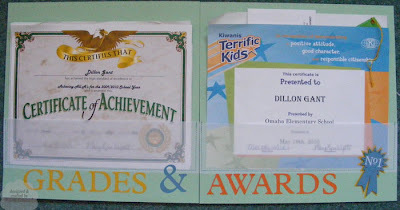 I owe my stepdaughter some pages for Dillon's school album. And maybe I'll get in a walk because it is supposed to be blessedly cooler at last! "... The trick is to grow up without getting old", Frank Lloyd Wright says. 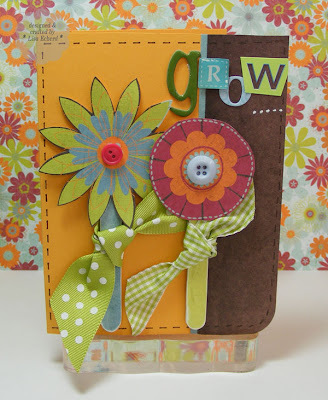 The trick to using bright More Mustard, Melon Mambo and my precious Baja in a color challenge is watering down. Not literally, but I did dilute these colors to make them more palatable to me. Baja breeae is stamped off one time for one of the flowers on the background here and then a second time for the flower on the right. The edge is colored with More Mustard pastel. I stamped a plain ivory flower with Melon Mambo using the Medallion stamp which gives is a muted look. Finally, I found a use for the mostly white side of one of those color pads - this time the one with More Mustard. Finally, the ribbon really does match Melon Mambo but being partially sheer fits in with the muted theme. Using a fair amount of the Espresso helped this out too. I really like that shade of brown. The ink is Dark Brown from Colorbox and it matches Early Espresso really well. Ink: Dark Brown by Colorbox; Baja Breeze, Melon Mambo by SU!